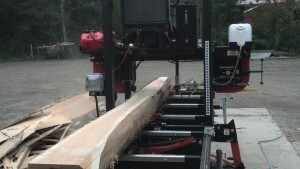 In an effort to better serve customers, we purchased a machine to do custom sawing. Don’t put that beautiful tree from your yard in a wood chipper. Have us slab it out, make siding, rough sawn timbers, Bar-Tops; you name it. We can currently do 34” diameter and up to 30’ lengths. Trees would have to be brought to Medford Cedar and be able to be fork lift unloaded (which we will do). Sawing is $100 an hour and most logs can be sawed in about one hour. Keep in mind, the thinner the slices the more labor involved. 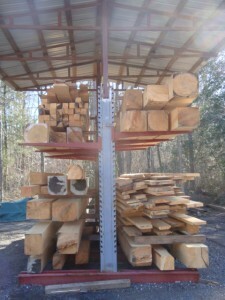 Medford Cedar can now mill your timbers here in house. Up to 32” diameter and 20′ long; we can cut what dimensions YOU need. Currently the saw is being used to make cedar clap-board sidings so don’t rule out the option of having us mill siding from your own trees. 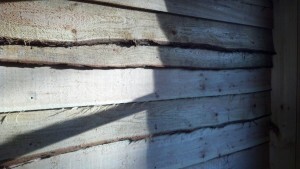 Atlantic White Cedar Clapboard – usually 1/2” X 6” but can be 1/2” X 8 – No taper but still applied like a bevel siding. Many New Jersey 100+ year old houses were built with this product and many people re-apply today because of it’s timeless look. 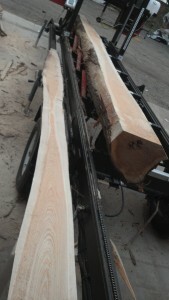 Recently we have had the opportunity to to buy large, old growth, white cedar logs and have been milling clear boat stock. We have delivered planks to boatbuilders all around New Jersey, parts of New York and Maine, and hope to grow the distribution in the next couple years.